AMACOM/American Management Association, 9780814408636, 255pp. Each generation leads in its own way. But to progress together, they must find ways to bridge the divide between their perspectives. Recognizing that truth, a 65-year-old traditional CEO and his 35-year-old Zen entrepreneur son embark on a six-month-long, 100-mile walk. 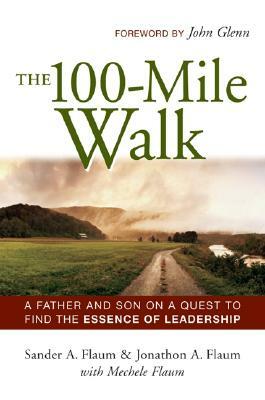 As they stroll the streets of New York and New Orleans, trek through the Blue Ridge Mountains, and hike along the Long Island coast, they talk about their experiences, their outlook on life and work, the achievements of leaders they have known, and how each views the nature and purpose of leadership. Ultimately, the two men agree on nine key traits and practices essential to all leaders -- from principles and passion to performance and even paranoia -- and on how leaders and aspiring leaders can follow them consistently. Father and son also discover a lot about each other, their relationship, and the way two generations set apart by so many differences can respect and learn from each other. Sander A. Flaum (New York, NY), an expert in healthcare marketing, was named Man of the Year for the industry in 2002. Now CEO of Flaum Partners, he is former chairman of the advertising agency network Euro RSCG Life and founder of the Leadership Forum at Fordham Graduate School of Business. He has appeared on MSNBC, CNN, Bloomberg, and other TV networks. Jonathon A. Flaum (Asheville, NC) is a speechwriter and coach for leaders and founder/CEO of WriteMind Communications.